QCARBO Fast Cleansing Formula. Strawberry-Mango Flavor. Designed as a stand-alone solution for lightweight and infrequent users, QCarbo Easy Cleanser is the most reliable way to prepare for a urine drug screen. With a fast cleansing formula that will flush toxins and drug metabolites from your urine in just one hour, QCarbo is a no nonsense solution for rapid detoxification. 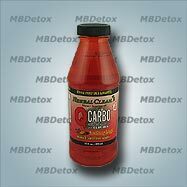 Fortified with a variety of nutrients (such as vitamin B, potassium, creatine, Echinacea extract, and creatine) QCarbo is a trusted name in fast detox. QCarbo Easy Cleanser comes in a 16 oz. bottle and is available in 6 great tasting flavors: Cran-Apple, Cranberry, Grape, Tropical, Orange, and Strawberry Mango. One hour before test time, drink the entire bottle of QCarbo Easy Cleanser. Within 15 minutes of drinking QCarbo, refill the empty bottle with with water and drink again. Urinate frequently over the following 45 minutes and then be ready to submit your urine sample as soon as possible. If you have not submitted a urine sample 2 hours after drinking QCarbo, drink another 8 ounce of water to help extend the effects of your detox beverage. We also recommend Pre-Tox Master Capsules as a preliminary cleanse prior to QCarbo Easy Cleanser. This product is great asset to those who want to ensure their success. For best results make sure you chose the product that is right for you. Heavy weight and habitual users should use QCarboPlus with Super Boost Capsules or use an appropriate Complete Detox Kit. QCarbo should be used on test day one to two hours before test time to provide results exactly when needed. The effects of QCarbo Easy Cleanser are temporary, so be sure to time your use appropriately.